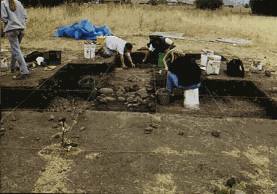 Beginning in 1996, a UC-Berkeley team, under the direction of Stephen Silliman, conducted archaeological research at the Petaluma Adobe State Historic Park. This is the first full-scale archaeological project conducted in the park since the early 1960s. The project was designed to locate and study evidence of the Native Americans who lived and worked at the Petaluma Adobe in the 19th century. Granted to Mariano G. Vallejo in 1834, the Rancho Petaluma, which is the broader name for the land grant on which the Petaluma Adobe stood, sprawled for over 66,000 acres in the area bordered by Sonoma Creek and the Petaluma River. Though owned and operated by a Mexican-Californian, the key feature of the Rancho Petaluma was the large number of California Indians brought to the Adobe as a labor force. This fact is indisputable in the historical record, but the exact nature of work life, the location of native residential areas, and the numbers and composition of the native work force has never been located in written history. To broaden the current picture of history in the North Bay and to generate new information on the effect of colonialism on California’s native population, the UC-Berkeley archaeological project began in 1996. 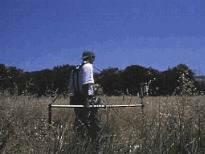 That summer, the UC-Berkeley archaeological team conducted pedestrian surveys, geophysical surveys, and shovel-test probes to try to locate material evidence for the native workers. The results were successful -- historic-period midden materials were discovered in survey and numerous below-ground features were detected through the geophysical surveys. One feature of interest was a linear anomaly that appeared to be a cobble foundation buried below ground. The spring and summer of 1997 brought even more archaeological research. Surface collection units were distributed across the midden area, and two test units were sunk to 0.5 m below ground in the area of highest artifact concentration. These revealed large accumulations of animal bones, obsidian flakes and tools, chert flakes, shellfish remains, glass "trade" beads, shell beads, grinding stones, glass bottle fragments, ceramic sherds, and an array of metal items including buttons, nails, and flatware. In addition, a large number of artifacts such as stone tools, glass, metal, glass beads, and ceramics were discovered. Near the midden area, the archaeological team also opened two trenches across the geophysical anomaly presumed to be a cobble foundation, and excavation revealed the expected linear array of cobbles at one end of the trench. It seemed that this was one of two buildings shown on an 19th century survey map for the Rancho Petaluma. The other end of the trenches offered a large cobble cooking/processing feature, two pits of burned bone and wood, and several clusters of unburned and articulated animal bones. The final phase of field work began and ended in the summer of 1998, expanding excavations outward from the previous year’s efforts. The midden units were connected to form a trench, which again revealed a wealth of 19th century material culture. In addition, the field crew excavated the area around the 1997 trenches as part of a block excavation. This entailed a large section (approximately 23 sq. meters) being opened to try to better define the nature and contents of the presumed adobe structure. The findings were both exciting and unexpected. On one side of the presumed foundation, the block excavation revealed a large bone feature that extended for approximately 6 square meters. 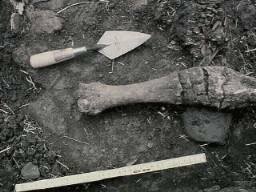 The feature contained a large number of animal bones including both cattle and fish, nails, shellfish, obsidian flakes and tools, groundstones, fire-cracked rock, burned wood, and other items. 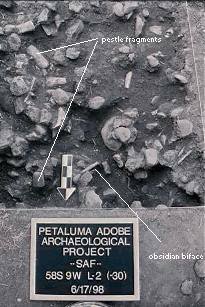 These remains are unequivocal evidence of residential and perhaps work debris left by the native people during Vallejo's occupation of the Petaluma Adobe area. However, a question still remains as to where exactly the native residential structures were and how they looked. Was the team truly digging inside or near an historic adobe building that may have housed native laborers? Further excavation revealed that the presumed cobble foundation might not be a foundation at all, looking more like a natural concentration of stream-like deposits. Future investigation is necessary before offering a final conclusion. In summary, substantial evidence has been recovered by the UC-Berkeley archaeological team that will offer significant insights into the Petaluma Adobe State Historic Park. So little is known about the Native Americans who worked at the Rancho Petaluma, in large part because of the sparse historical documentation. Thankfully, archaeology is able to cast new light on those dark spaces in the history of 19th century Mexican-Californian ranchos. Most importantly, the work being conducted at the Petaluma Adobe State Historic Park has direct historical and archaeological ties to other California State Parks such as the Sonoma Mission and Fort Ross State Historic Park.